We're about to say good-bye to 2016, so I took a quick look through the past year here on the NMS blog, and figured since David Letterman isn't giving us TOP TEN lists anymore, that I'd have to do it myself. From autocross, to auto shows, to engine work and lots of other car stuff, here's some of the highlights from the NMS camera crew. One big highlight for NMS was Brian's design of the "Coneavore", an autocross cone-eating Miata. He put this one on his car, and also sent the Coneavore in to the T-shirt guys at Blipshift.com, and they sold 300 of them! Brian also came up with the cool NMS-South logo, the NMS blog design, NMS-North design, and basically everything cool that says NMS on it. The NMS 1999 Miata had a bit of an issue back in 2015, so a lot of the early 2016 season was spent by Brian and the South Carolina crew getting the engine back together, tweaking the suspension, testing various tires, etc. In case you're wondering what the inside of a Miata four cylinder engine looks like, this photo shows a bit of the detail. This is the motor that went on to compete in a lot of events this year, including major SCCA events in Georgia, Tennessee, and the Nationals in Nebraska. The Miata also received a new interior, so before that could be completed, all the old stuff had to come out. If you're still wondering about Miatas and wanted to see one with the seats out, the carpet gone, here ya go! This procedure is also a GREAT way to make money, if you find 62 cents hiding in the carpet, seats, and all those hard to reach places that are a lot easier to reach with the seats taken out of your car! Meet Jason Rucker, shown here during the SCCA competition at Bristol TN. Jason's outer hat is the prize for placing in the top 4 in a two day long competition! Jason won several other regional SCCA events for fastest PAX time with the NMS Miata, and placed the highest of the four South Carolina drivers in E Street class at Nationals. NMS-North got out of the house and did some kart racing with some of the Tidewater Sports Car Club members over the winter, and learned a lot. Some of the things he learned are that 1: He's not fast in a cart, and 2: He's very slow in a cart! We know that most of the professional drivers in the NASCAR, Indy, Formula 1 races started their careers driving carts at around 4 years old. Robert apparently didn't get this memo, and is still trying to find some 4 year olds he could take driving lessons from. Regardless, indoor and outdoor karting is a ton of fun, and we recommend it very highly. Wear a helmet, fasten that seat belt, and hold on! At one of the autocross events in Virginia, Robert drove the FIAT and had Max Curtner ride along. These two guys served together in the Army in a little place that rhymes with Iraq, so Max had a fun day riding along. We kind of think he'll be autocrossing soon too. In this photo he's displaying that "WOW, THIS IS REALLY FUN TO DO, I CAN'T WAIT TO DRIVE LIKE THIS" look that we always see when someone tries autocross for the first time. During a very hot event in Charleston SC, we snapped this photo of Jason Rucker and Brian Nixon, who were both smart enough to be getting in the shade when they could. These guys teamed up all year, co-drove the NMS Miata, and took on events in at least six states this year. One of the best ways to get better at autocross is to maximize your seat time, or time behind the wheel. You can basically double the knowledge gained by sharing the same car with another driver, compare notes on driving techniques and tire pressures, and keep working hard to improve the car and the drivers. On the same day in SC, our crew managed to get an awesome photo of this 1958 Edsel driving on the autocross course. On the blog it doesn't look as cool as it did in person, but you can click on the photo to get a better view too. Just about any car can compete in autocross, and this right here is photographic evidence of that little fact! One of the drivers we've met while competing is Mr. Pete Frazier, standing on the right of this photo. Pete and his sons Cooper and Conner here have been having a blast autocrossing a variety of cars that they've developed, including this MR2, a Miata, a Lotus, and Pete says they've got a couple of Porsches recently that just might be driven in events in the future. I'll take a wild guess that these guys get along pretty well, so you can certainly say that autocross is family friendly. Just ask Team Frazier! Did we say that just about any car can autocross yet? Yes? Good! It's still true, and here's another car from 1958 to prove the point. In this case, it's a Morgan roadster, all the way from England, and with left hand drive. Besides the cool Morgan, the other reason I love this photo is the view of the scenic Chesapeake Bay, the sailboat out there, and the bright orange cones showing some previous "battle damage" from close encounters with other drivers. When you knock over a cone in autocross, it adds 2 seconds to your time, so the idea is to drive as fast as possible without hitting them! As fans of Italian cars like the NMS FIAT 500 Abarth, this photo from a Virginia Beach Cars and Coffee pretty much shows the high and the low, or the cheap and the expensive, in Italian automobiles. The red Ferrari in the foreground is contrasted with the much cheaper FIAT next to it. I guess that's why I bought the FIAT, since it's Italian and I can' afford Ferraris! Speaking of Italian cars, Alfa Romeo continues to bring new cars to the US, and this yellow Alfa 4C was spotted at the Washington DC Auto Show early in the year. In addition to the awesome carbon fiber bodied car you see here, Alfa is about to start delivering the Giulia sedan to US dealers. Then, likely next year, we'll see the all new Alfa Romeo SUV, named Stelvio, for the famous pass in the Italian Alps. Michael Moore joined up with the NMS-North team, and co-drove the FIAT at several events this year. When he's not busy working for the Army, Michael is in the midst of restoring a classic Nissan Z car at home. At the event in this photo, we got stuck driving in wet conditions, but had a fun day anyway. Some of the video from this event featured some close-ups of huge water drops on the roof top camera, so nothing to write home about, but entertaining to watch. We had some hot days, we had some wet days, and then around Thanksgiving we headed north to visit relatives and drove in some of this white stuff too! Sliding around in the snow can be fun, but mostly the snow reminds me to tell you to keep your car in good shape; watch your tire conditions; have emergency supplies if you're driving long distance in the snow; buckle that seat belt, and always look out for the other people on the road. 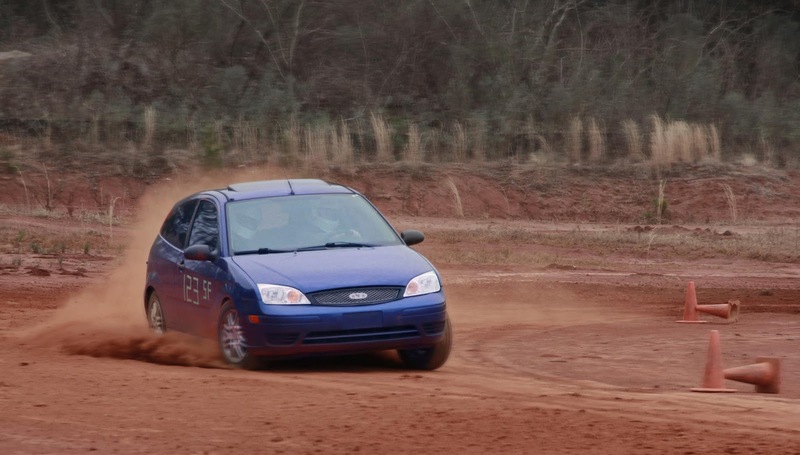 The South Carolina Region (SCR) of the Sports Car Club of America started to hold some Rallycross events in 2016, and they are planning a full season of competition in 2017 too. Rallycross is just like autocross, BUT, you do it on unpaved dirt, rocks, gravel, or whatever isn't pavement! Check the SCR website in our links section to keep up with their schedule. We hope you've enjoyed the 16 photos in our TOP TEN PHOTOS blog. If you're worried about our math skills, just remember what Yogi Berra said about baseball, and apply it to driving: "Baseball is 90% mental and the other half is physical."